Computer reconstruction of the five Dmanisi skulls found so far. The National Geographic Magazine is a wonderful resource for those interested in archaeology. The photographs and associated material such as graphs and maps, as well as the text, are of a very high standard. I am grateful to the magazine for the resources it publishes in its magazine and website. Many of the photographs and much of the text on this page come from the NG for August 2002 and April 2005. The site is situated on the promontory formed by the confluence of the Mashavera and Phinezauri Rivers, in the middle foreground of this photo. The site may just be seen to the right of the photo, delineated by the pink roof of the church which stands there. 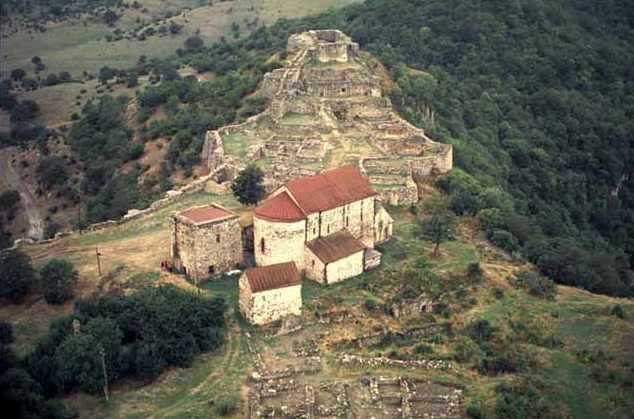 The site is located southwest of Tbilisi. 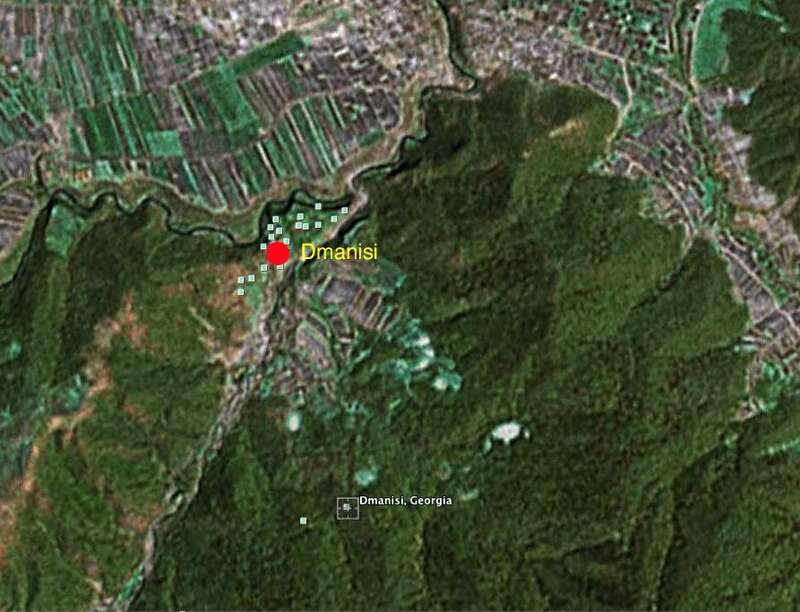 When I go to Dmanisi using Google Earth, I get a point in the middle of a forest, at 41° 19.000' N, 44° 21.000 E.
I came to that conclusion because there are a lot of "panoramio" shots there of the local church, but more importantly the local geography is right. It is a peninsula where two rivers join, a position confirmed by photographs and site descriptions. 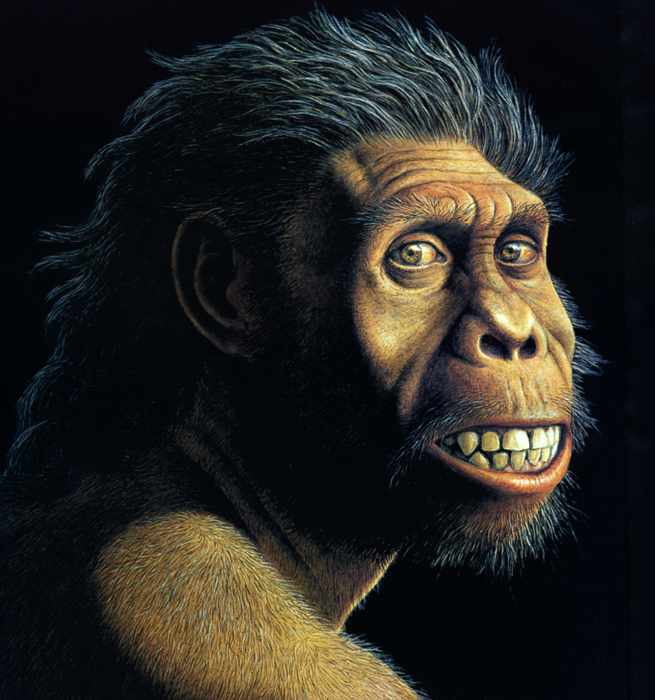 Artist's impression of a Dmanisi hominin. As reconstructed here, it resembled the chimp-like Homo habilis, a 2.4 to 1.6 million year old hominin with long arms and short legs. These are proportions that some have thought better suited to life in the trees than for trekking from Africa. It had a thin brow, a small nose, and a brain less than half as large as a modern human's. Skull from which the artist's impression above was derived. Both of these photos appear to have been set up using the D 2700 cranium and the D 2735 mandible. 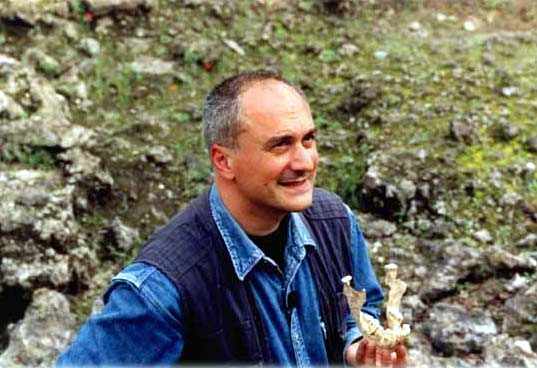 The man holding the skull and mandible in the right hand photo may be David Lordkipanidze, director of the Georgia Museum, and head of the Department of Geology and Paleontology. It also seems that the D 2735 mandible in the black and white photo below in the scientific paper has been printed back to front. This site of early hominins is in Georgia, south of the Caucasus Mountains and the capital, Tbilisi, east of the Black Sea on a wooded promontory surrounded by steep cliffs and water on three sides, that might have provided an ideal place to drive game into a contained area, to make it easy to hunt. Photos: (L) National Geographic August 2002, (R) http://www.dmanisi.org.ge/, the official Dmanisi website. Professor David O. Lordkipanidze, Director of the Georgia Museum, and Head of the Department of Geology and Paleontology. 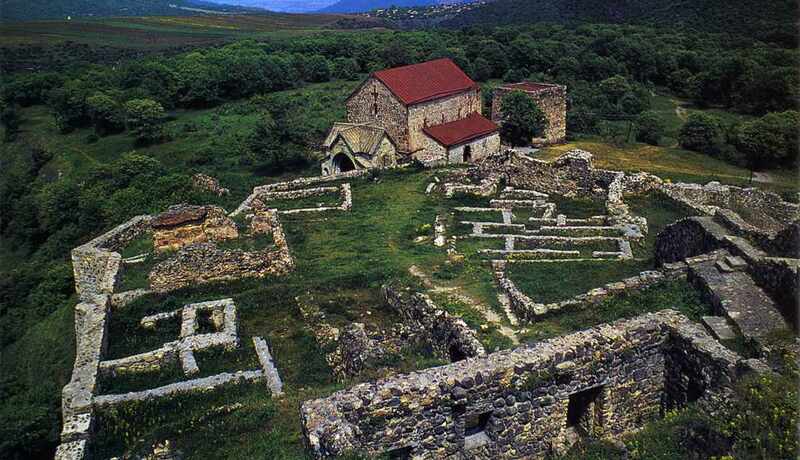 He is in charge of the excavations at Dmanisi, which is located on the territory of the medieval town of Dmanisi. 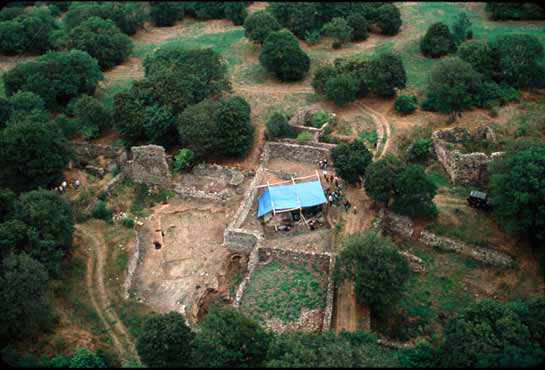 The new skull was found on a hill among the ruins of a medieval village called Dmanisi, a few hours from Georgia's capital, Tbilisi. 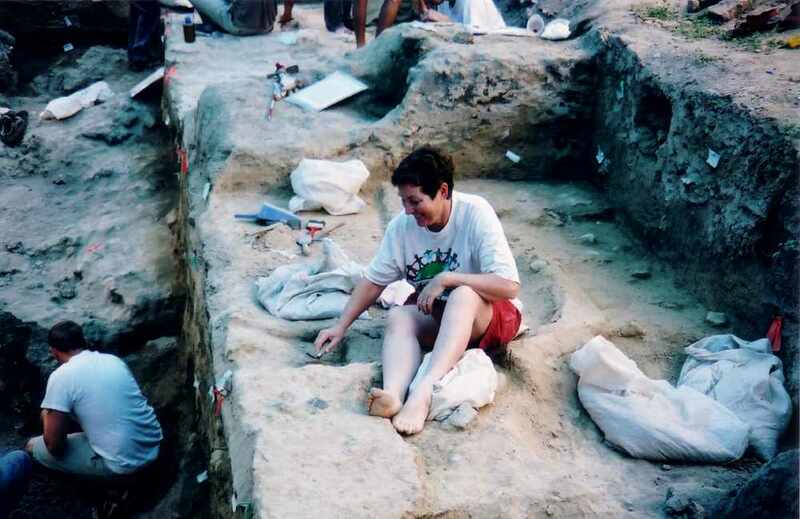 The dig (under blue canopy) has been producing fossils of early humans since the early 1990s. 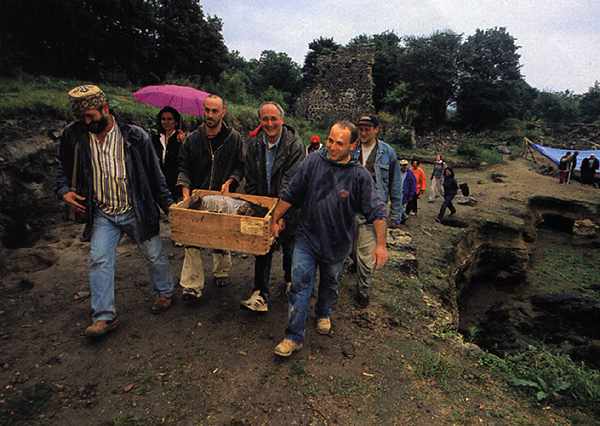 David Lordkipanidze (fourth from left) and fellow scientists carry a crate holding a 1.77 million-year-old human cranium - the toothless 'old man' - dug up in 2002. The site has yielded a rich array of Homo erectus bones. On a regional visit of OSCE (Organization for Security and Co-operation in Europe) countries, Ambassador and Mrs. Minikes stopped at the Dmanisi archeological dig in Georgia. Ambassador Minikes, the U.S. Ambassador to the OSCE, toured the site with Georgian State Museum Director, David Lordkipanidze. This photo shows American graduate scientists hard at work, each on their own small area under the shade of a blue tarp. A newly discovered 1.8 million-year-old skull from Eastern Europe has been pitched as disproving a decades-old paradigm in human evolution. 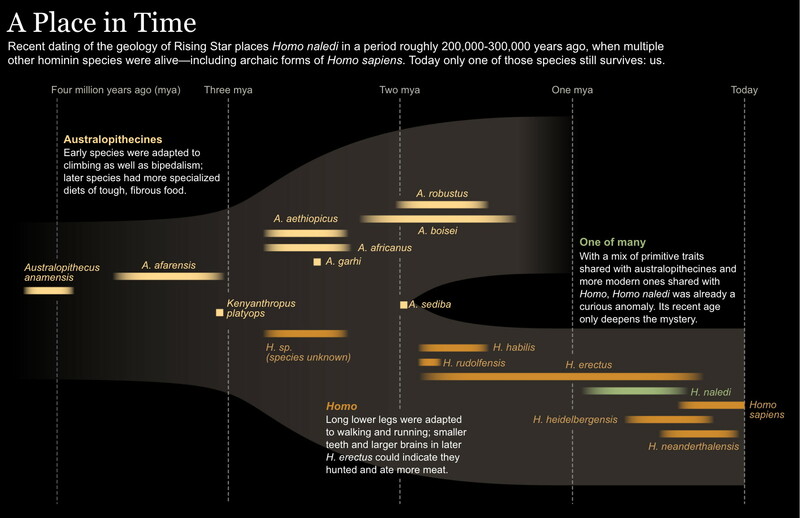 Its discoverers claim the find sinks more than a dozen species into a single evolutionary line leading to living people. But the new study highlights the propensity of some anthropologists to overstep the mark, interpreting the importance of their finds in a way that grabs the headlines. 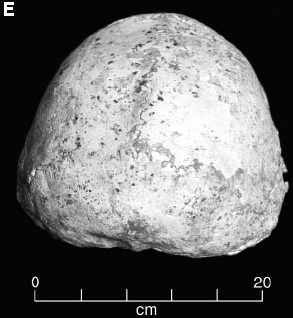 David Lordkipanidze and co-workers described and compared a new skull from the Dmanisi site in Georgia, dated to around 1.8 million years old. It is one of five skulls in varying states of completeness. The latest one ('Skull 5') is well preserved and includes a matching lower jaw. 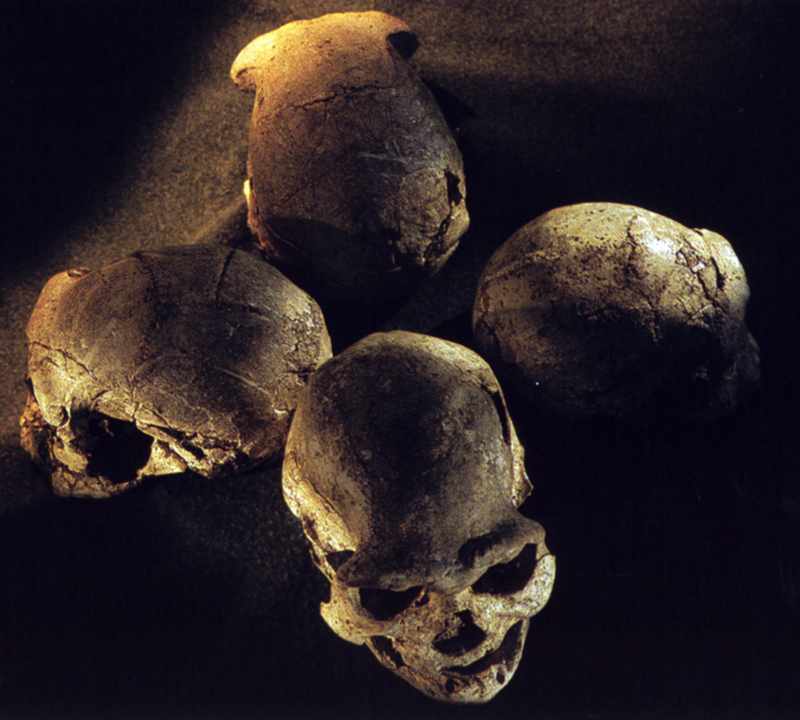 Until now, it was generally accepted that some of the Dmanisi skulls probably came from different species. 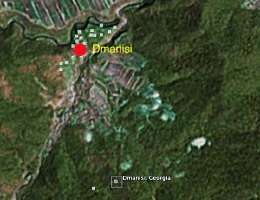 However, Lordkipanidze has said previously that all of the human remains from Dmanisi are a single group, perhaps killed in a natural disaster. This is possible but difficult to substantiate, because of errors in dating methods. 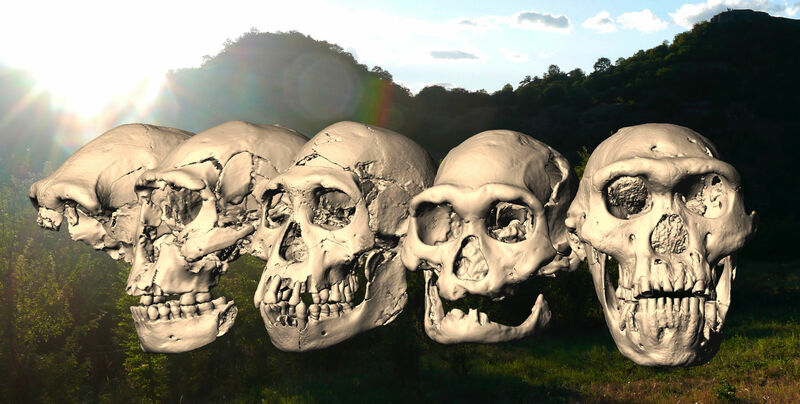 Using three-dimensional computing, this new study now also claims the differences in 'shape' among the five ancient Dmanisi skulls is no more pronounced than observed between five living humans or five chimpanzees. This is despite the fact that when the anatomical features (such as the eyebrow bone) of the skulls have been examined by experienced biologists rather than abstract computer methods, researchers like Jeffrey Schwartz have suggested that the Dmanisi sample contains multiple species. But here's the potential killer blow for anthropology. 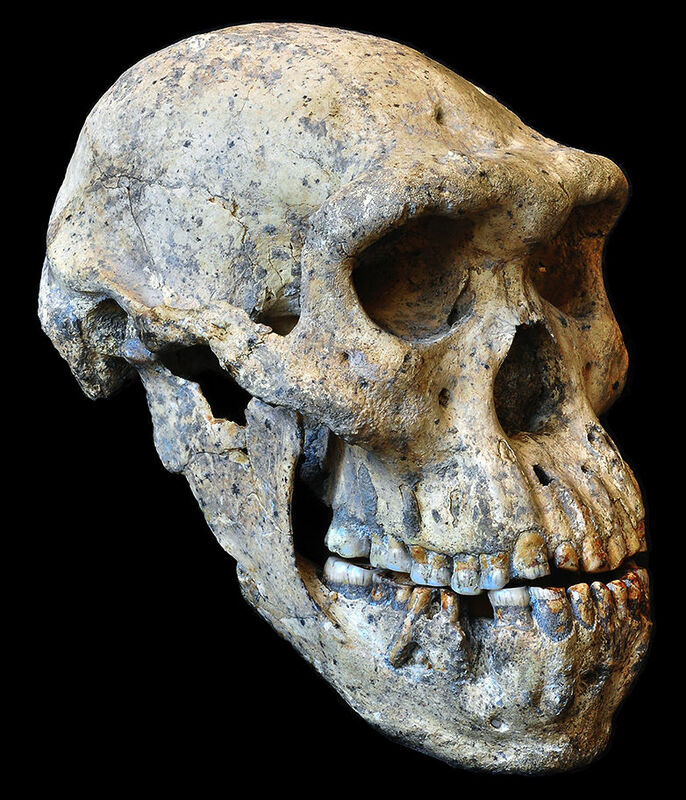 Lordkipanidze and colleagues say their work shows the entire early fossil record for Homo – comprising perhaps nine species dating between about 2.3 and 0.5 million years old – is in fact a single long-lived group. Cranium, Dmanisi, Georgia. D2700, D2735. Circa 1 800 000 BP. Partial cranium, Dmanisi, Georgia. D2282. Here’s the list of now apparently defunct species: Homo habilis, Homo rudolfensis, Homo gautengensis, Homo ergaster, Homo georgicus, Homo soloensis, Homo pekinensis, and Homo mauritanicus. All of them would now be sunk into Homo erectus according to the study findings. Their work also has major implications for later Homo, implying that a further six species should all be sunk into our kind, Homo sapiens. 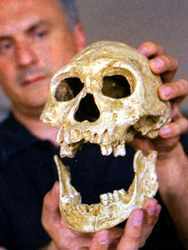 The species no longer required would be: Homo heidelbergensis, Homo rhodesiensis, Homo antecessor, Homo neanderthalensis, Homo helmei and Homo floresiensis. So, the entire ~2.4 million years of evolution of the genus Homo comprises, this new study proposes, at most two species: Homo erectus and Homo sapiens. These would both belong to a single evolutionary line rather than being separate twigs within a bush of species. Most anthropologists would currently recognise at least nine and up to 17 species of Homo, so the pruning would be about as radical as one can imagine! Bones from a spinal column discovered at a nearly 1.8-million-year-old site in central Asia support the controversial possibility that ancient human ancestors spoke to one another. 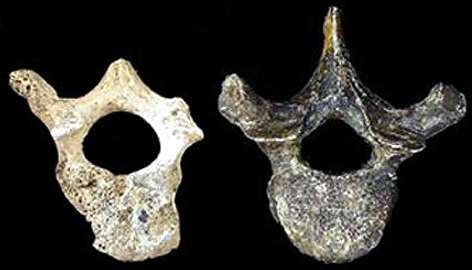 A recently discovered Homo erectus vertebra from central Asia (left) displays a larger spinal cord canal than does a corresponding bone (right) from a skeleton that had been found in Kenya. 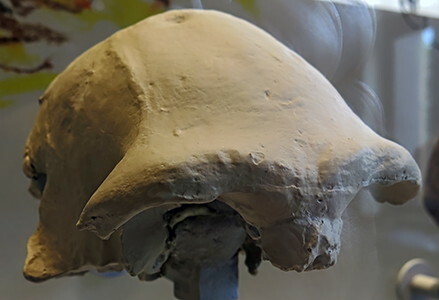 The new discoveries represent the oldest known vertebrae for the genus Homo, Meyer announced last week at the annual meeting of the Paleoanthropology Society in San Juan, Puerto Rico. The fossils consist of one lumbar, two thoracic, and two cervical vertebrae. Meyer and his colleagues — David Lordkipanidze and Abesalom Vekua, both of the Georgian State Museum in Tbilisi — compared the size, shape, and volume of the Dmanisi vertebrae with more than 2 200 corresponding bones from people, chimpanzees, and gorillas. "The Dmanisi spinal column falls within the human range and would have comfortably accommodated a modern human spinal cord," Meyer says. Moreover, the fossil vertebrae would have provided ample structural support for the respiratory muscles needed to articulate words, he asserts. Although it's impossible to confirm that our prehistoric ancestors talked, Meyer notes, H. erectus at Dmanisi faced no respiratory limitations on speech. In contrast, the 1984 discovery in Kenya of a boy's 1.6-million-year-old skeleton, identified by some researchers as H. erectus and by others as Homo ergaster, yielded small, chimplike vertebrae. Researchers initially suspected that the ancient youth and his presumably small-spined comrades lacked the respiratory control to talk as people do today. 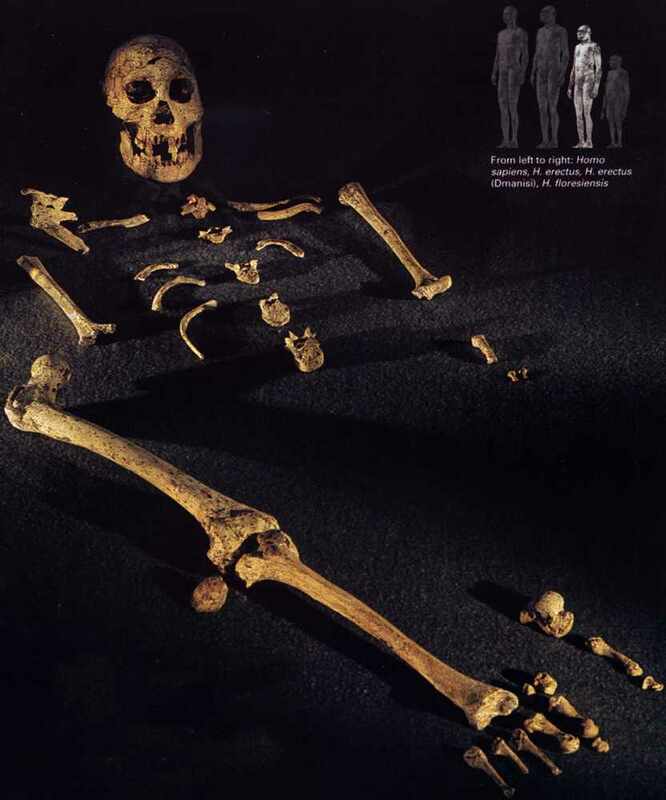 In the past 5 years, investigators including Bruce Latimer of the Cleveland Museum of Natural History have suggested that the prehistoric boy offers a misleading view of H. erectus' backbone. They contend that growth of the bony canal encasing his spinal cord had been stunted, and spinal cord compression would have impeded his movement and caused limb weakness. 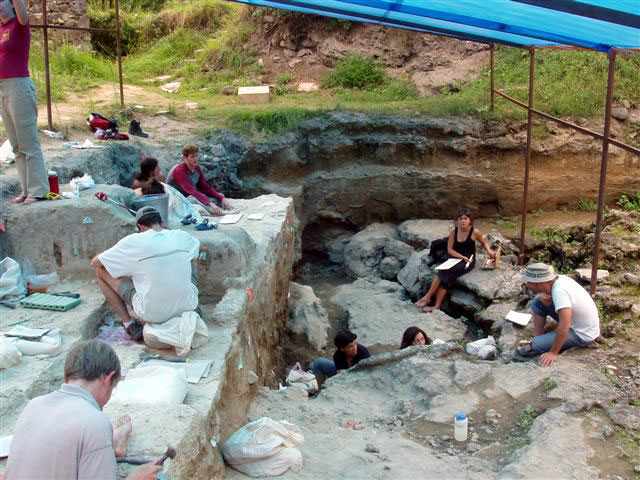 Finding ancient, humanlike vertebrae at Dmanisi fits with Latimer's view, Meyer says. Infant malnutrition, which often arrests growth of the human vertebral canal, may have affected the H. erectus youth, Meyer suggests. The ancient boy, who died at age 10 or so, would have required intensive protection and provisioning, Meyer asserts. "Both altruism and spoken language may have been part of the behavioral repertoire of early Homo," the Pennsylvania researcher says. 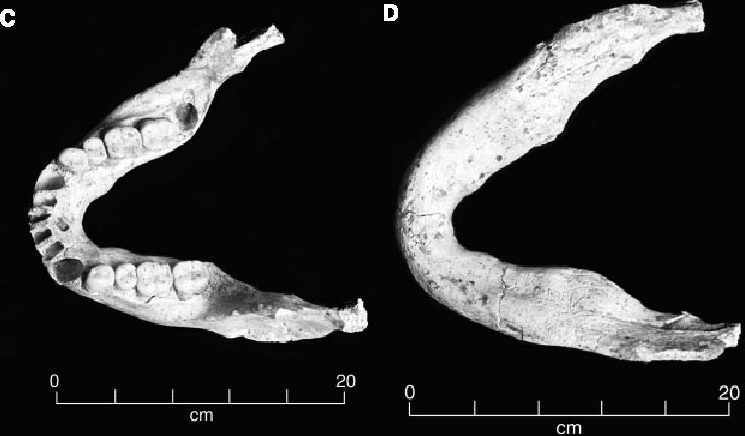 The modern-looking vertebrae at Dmanisi, remarks David Frayer of the University of Kansas in Lawrence, comport with earlier fossil-skull studies indicating that early Homo possessed a speech-ready vocal tract. Robert C. McCarthy of Florida Atlantic University in Boca Raton disagrees. At the Paleoanthropology Society meeting, he presented vocal-tract reconstructions for various ancient Homo species suggesting that the capacity to articulate speech as well as people do now emerged exclusively in Homo sapiens around 50 000 years ago. Before then, all members of the Homo genus — including H. sapiens — possessed a short set of neck vertebrae, resulting in a vocal tract with a restricted range of speech sounds, McCarthy and his coworkers argue. Many populations today, including Australian aborigines, possess neck vertebrae comparable in length to those that McCarthy's team considered inadequate for modern speech, Meyer responds. "I have recently returned from the Republic of Georgia, after spending some time assisting in the excavation of the early hominid site at Dmanisi and undertaking some research on casts of the fossil hominids held at the State Museum of Georgia. 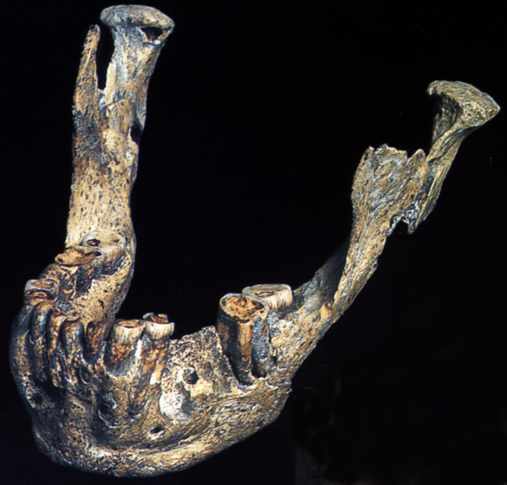 The site of Dmanisi yielded a hominid mandible in 1991 and a second in 2000, two hominid crania in 1999 dated to 1.8 Ma, followed more recently by a cranium and associated mandible." 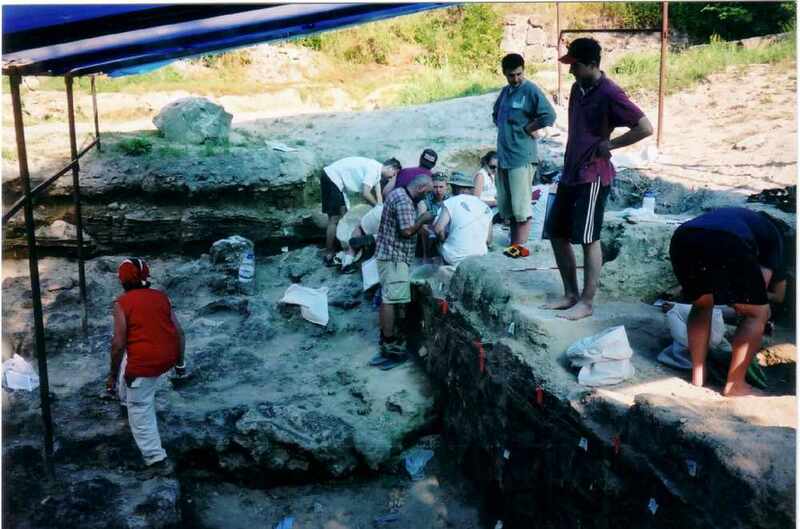 "As we were working on a newly opened up section of the excavation, we were nowhere near the lower level of the hominid-bearing 'Champagne Pool' (so named, I believe, because a bottle of French champagne - or a box? - is opened every time hominid remains are found), so I didn't actually uncover any hominids, but I did find some stone tools and unidentifiable bone." The bones in this display come from at least two of the four individuals found at Dmanisi. More than 50 human bones have been found at the site, the largest cluster of Homo erectus ever found in one place. From the study of the leg bones, it is estimated that one individual stood four feet seven inches, or 140 centimetres tall. The skull of this old man is humanlike but small, but the remarkable feature is the mouth. Not only are there no teeth, but nearly all the sockets are smooth, filled in by bone that grew over the spaces. The jaws look like two crescent moons. 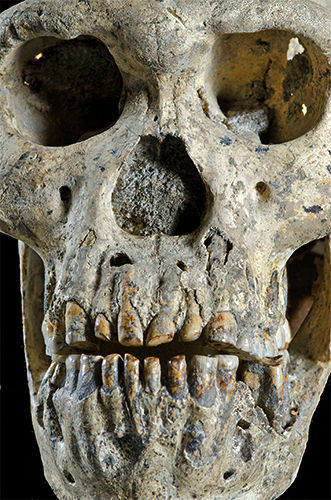 Although it's hard to be sure of his age, 'it looks like he was maybe about 40, and the bone regrowth shows he lived for a couple of years after his teeth fell out,' says Professor Lordkipanidze. 'This is really incredible.' How did the toothless old man survive, unable to chew his food? Maybe his companions helped him, says Lordkipanidze. 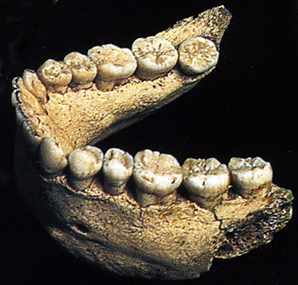 If so, those toothless jaws might testify to something like compassion, stunningly early in human evolution. You have to flash forward more than one and a half million years, to the Neandertals of Ice Age Europe, to see anything comparable. A nearly two-million-year-old fossil find in the Republic of Georgia may be evidence of the first signs of early human compassion, scientists say. According to a report published today in the journal Nature, the remains are from an individual who spent the last years of his life with only one tooth. This shortcoming may have left him dependent on the kindness of others in order to find sufficient sustenance. The site at Dmanisi, Georgia, has in recent years provided multiple fossil discoveries that suggest the presence of members of our genus, Homo, roamed outside of Africa 1.7 million years ago. In the new work, David Lordkipanidze of the Georgian State Museum in Tbilisi and his colleagues describe a skull and jawbone from a hominid male who had lost all but one tooth. The tooth sockets had been resorbed into the skull, suggesting that he had lost the teeth several years before dying. The discovery represents the earliest case of severe masticatory impairment in the fossil record yet found, the researchers say. 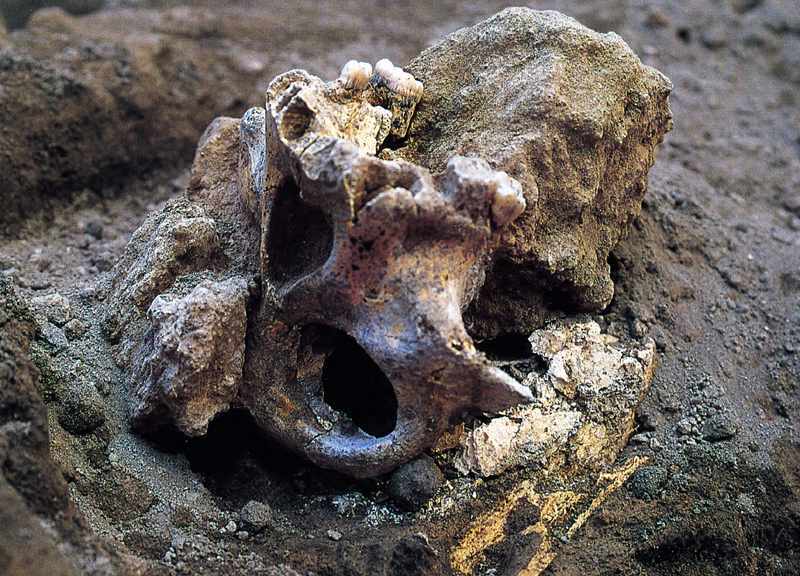 Partial skull and full skull found in Dmanisi. Abesalom Vekua, David Lordkipanidze et al. 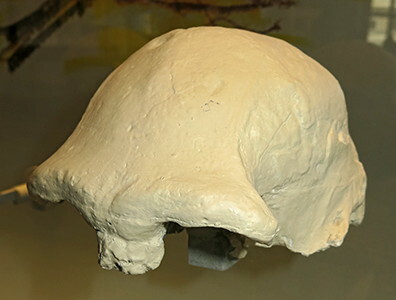 Another hominid skull has been recovered at Dmanisi (Republic of Georgia) from the same strata in which hominid remains have been reported previously. 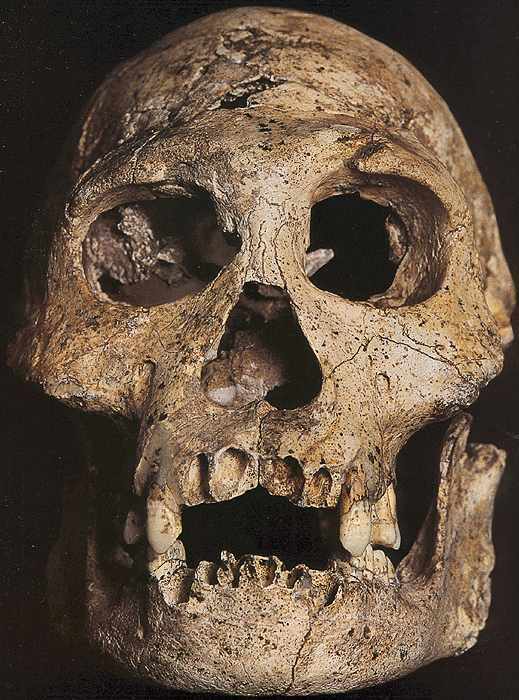 The Dmanisi site dated to ~1.75 million years ago has now produced craniofacial portions of several hominid individuals, along with many well-preserved animal fossils and quantities of stone artifacts. 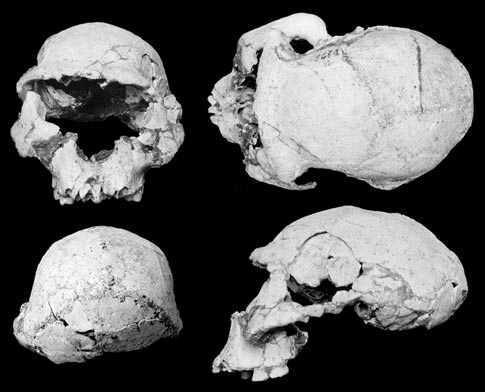 The D 2700 cranium. (A) Frontal view. (B) Lateral view. (C) Superior view. (D) Posterior view. (E) Inferior view. 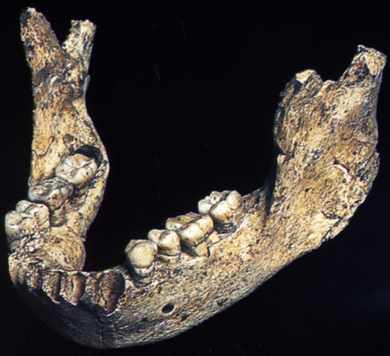 Views of D 2735 mandible. (A) Anterior view. (B) Lateral view. (C) Superior view. (D) Inferior view. Although there are certain anatomical differences among the Dmanisi specimens, the hominids do not clearly represent more than one taxon. 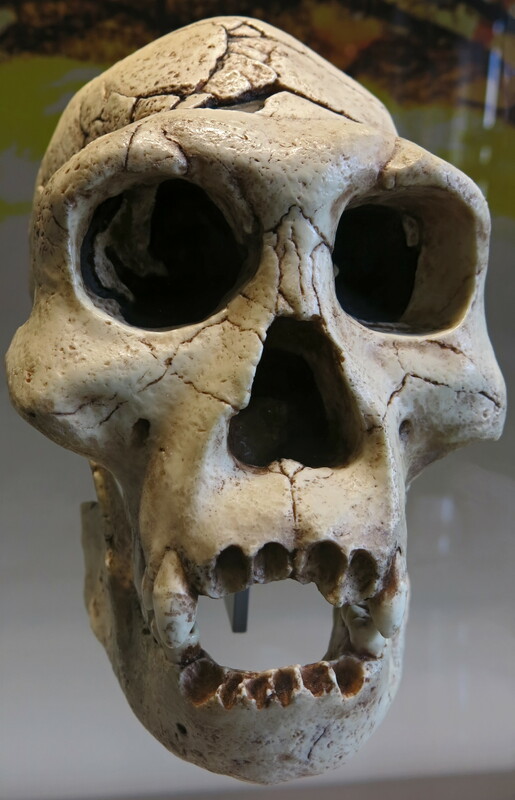 We assign the new skull provisionally to Homo erectus (=ergaster). 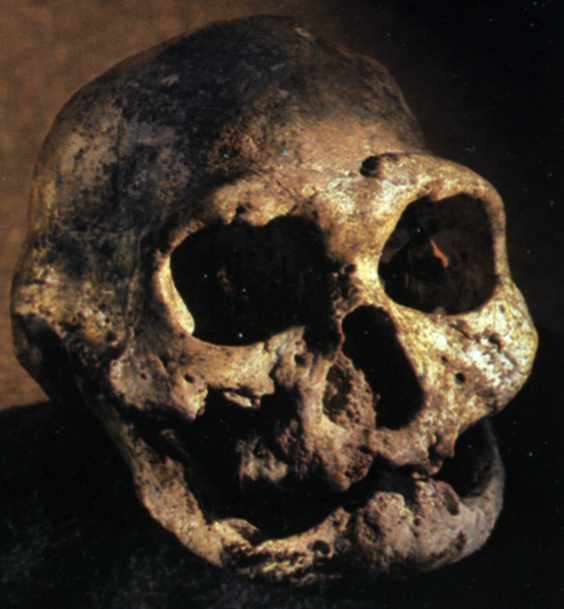 The Dmanisi specimens are the most primitive and small-brained fossils to be grouped with this species or any taxon linked unequivocally with genus Homo and also the ones most similar to the presumed habilis-like stem. (B) The locations of hominid fossils (excavation units are 1-m squares). (C) General stratigraphic profile, modified after Gabunia et al. The basalt and the immediately overlying volcaniclastics (stratum A) exhibit normal polarity and are correlated with the terminus of the Olduvai Subchron. Slightly higher in the section, above a minor disconformity and below a strongly developed soil, Unit B deposits, which also contain artifacts, faunas and human fossils, all exhibit reversed polarity and are correlated with the Matuyama. Even the least stable minerals, such as olivine, in the basalt and the fossil-bearing sediments show only minor weathering, which is compatible with the incipient pedogenic properties of the sediments. We suggest that the ancestors of the Dmanisi population dispersed from Africa before the emergence of humans identified broadly with the H. erectus grade. 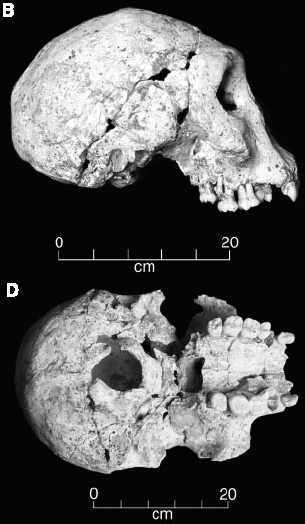 The new Dmanisi cranium (D2700) and associated mandible (D2735) were found in squares 60/65 and 60/66 (Fig. 1), embedded in the black to dark-brown tuffaceous sand immediately overlying the 1.85-million-yearold Masavera Basalt. Sedimentary horizons above the basalt also yielded two partial crania in 1999, along with mandibles discovered in 1991 and 2000. 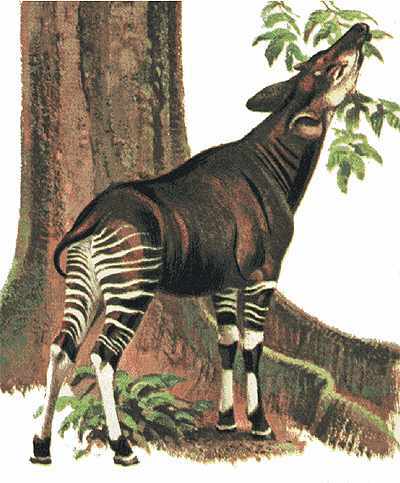 De etruskische neushoorn Stephanorhinus etruscus. a skull of Cervus perrieri with a full rack of antlers, a Dama nesti antler, two crania of Canis etruscus, a complete mandible of Equus stenonis, and the anterior portion of a Megantereon cranium. 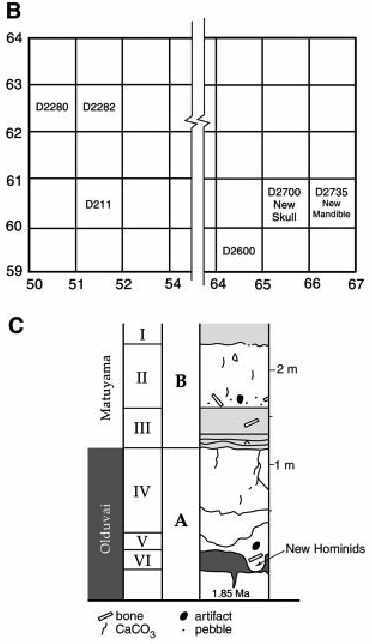 Human occupation at Dmanisi is correlated to the terminal part of the (magnetically normal) Olduvai Subchron and immediately overlying (magnetically reversed) horizons of the Matuyama Chron, and is ~1.75 million years in age. 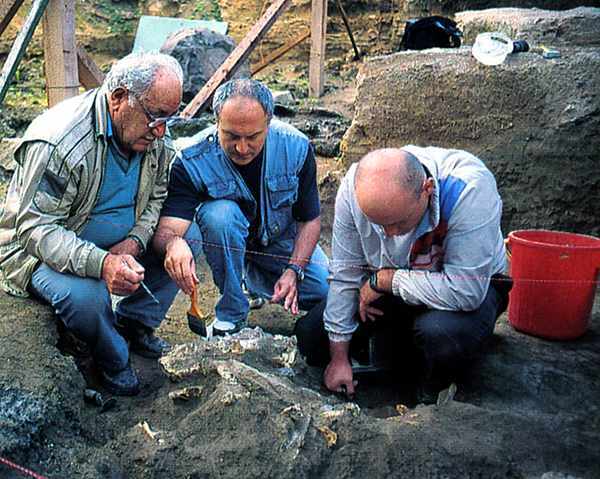 Faunal remains also support the dating of Dmanisi to the end of the Pliocene or earliest Pleistocene. The evidence suggests that much of the Dmanisi fauna was buried rapidly after death, in many cases with ligaments still attached, and that the bones were buried very gently, with minimal transport. [i.e. by the gentle settling of ash from a volcanic eruption, the tuff referred to earlier. Don H.] The protection afforded the bones in lower layers by the overlying calcareous horizon halted further diagenetic damage and compaction that normally occur. Sedimentological information and the appearance of all the fossils found nearby reinforce the conclusion that the hominid and faunal remains were deposited in a brief interval. Seventy percent of the assemblage is in weathering stage 0 or 1, and none in stages 4 or 5. Rapid, low-energy deposition was followed by formation of petrocalcic horizons higher in the section, which arrested further destruction of bone. We estimate that in the sample of over 3000 vertebrate faunal remains recovered thus far, about 30% of the specimens are unbroken, and almost 90% are identifiable to genus if not species. The diversity and high proportion of carnivores in the assemblage are paralleled by some tooth pits and characteristic carnivore breakage patterns, and also some hyena coprolites, but the general character of the assemblage in many ways does not fit conceptions of carnivore lairs. and hamsters (Cricetus sp., Allocricetus bursae) (12). Hamster, scanned from Webster's New International Dictionary of the English Language, 1911, G & C Miriam Co. Springfield, MA., now in the public domain. Works published prior to 1978 were copyright protected for a maximum of 75 years. It is interesting to see the differences between this image and the fluffy hamsters now sold in pet shops. Stone artifacts were found throughout the sediment section, but, as in the previously excavated areas, artifact concentrations are much larger in the upper deposits (Stratum B) than in the deeper sediments. All tools are produced out of local raw materials, and there is clear selection of finer grained stone such as quartzite and basalt for tool manufacture. The Dmanisi lithic assemblage belongs to a Mode 1 industry similar to the Oldowan of East Africa. 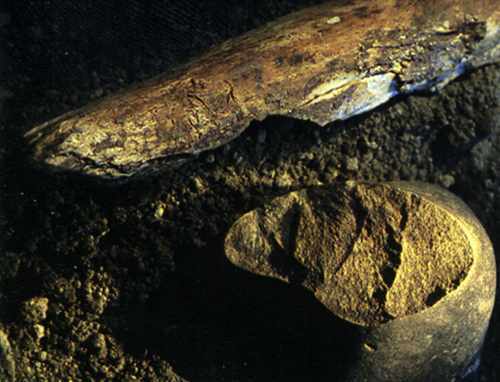 The Dmanisi finds imply that early humans with primitive stone tool technology were able to expand out of Africa. 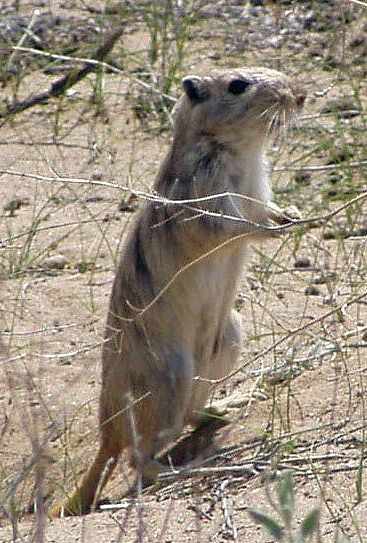 There is a wide variation in size of the individuals found. If individuals this varied could belong to the same species then the Homo family tree may have to be simplified, so that Homo habilis grades into the Dmanisi hominins, then to Homo erectus, then to Homo sapiens. 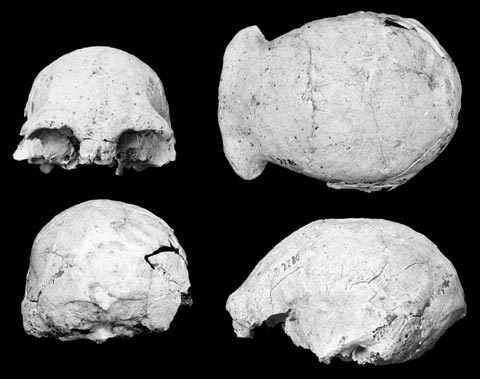 The Dmanisi skulls are small for erectus and rounded instead of angled at the back, traits reminiscent of an earlier species, Homo habilis, or 'handy man', which appeared in Africa before two million years ago. 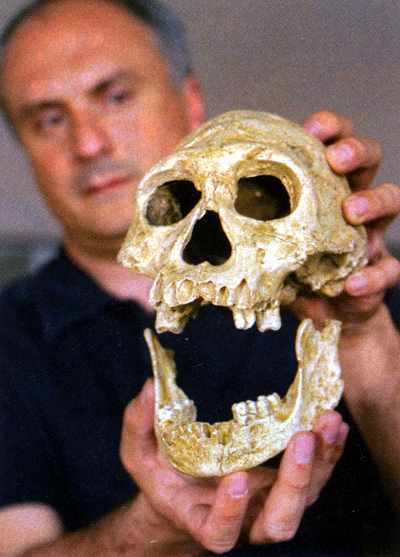 'My feeling is that we can say this is something between habilis and erectus, and maybe it's the founder of erectus,' says Lordkipanidze. 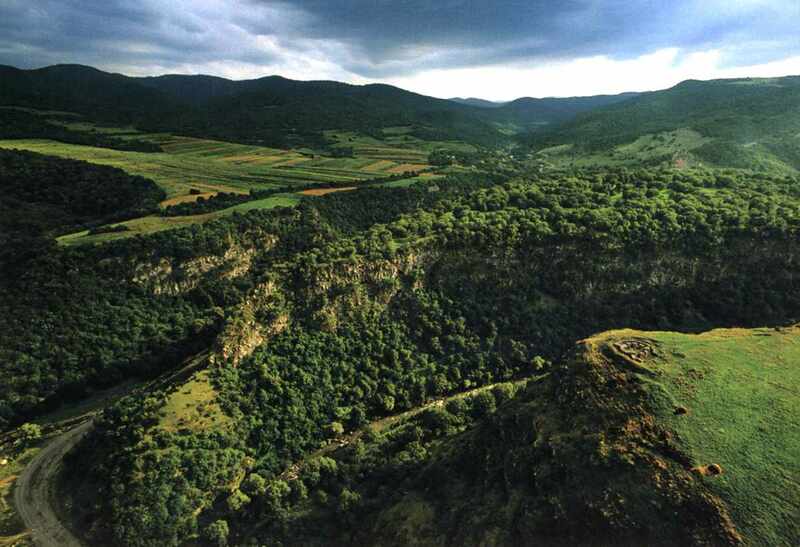 That would make Dmanisi the true starting point for the journeys of Homo erectus. 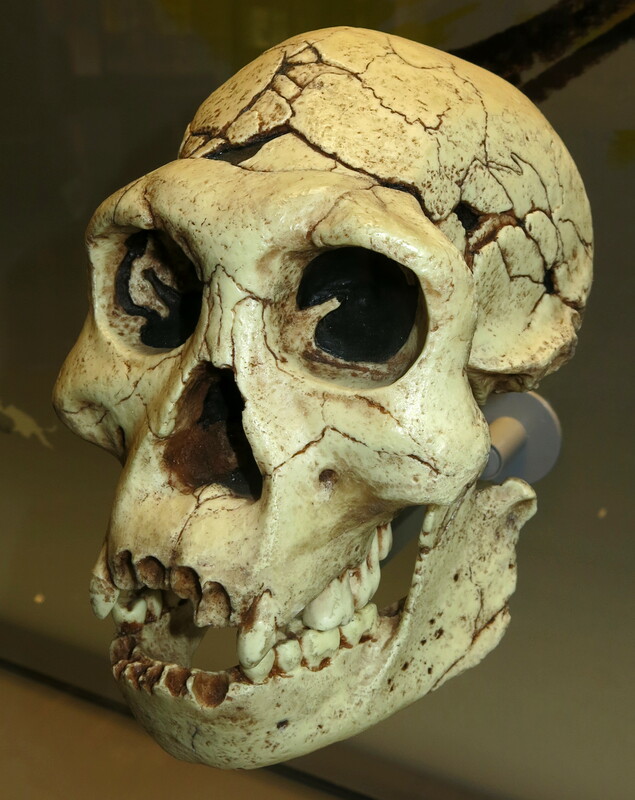 Here is how events might have unfolded: Dmanisi-like hominins evolved from Homo habilis in Africa by about two million years ago. Almost immediately they wandered out of Africa and through the Middle East to Georgia, completing the transition from habilis into erectus. Then they branched out. Some, the forerunners of Peking man and Java man, went on to East Asia and Indonesia. Others doubled back to Africa, where lanky and somewhat more slender African versions of erectus - which are also known as Homo ergaster - emerged later. In the end these erectus variants gave rise to modern humans, who ultimately set out on global journeys of their own. Skull in situ. This skull was nearly whole and exquisitely preserved. 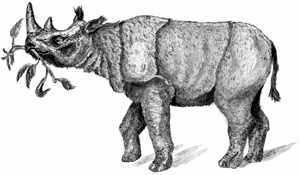 It was discovered in 2002, along with its upper arm bone. Upper arm bone associated with the skull above. 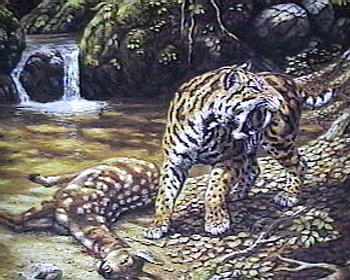 The fangs of this sabre tooth tiger, (either Homotherium crenatidens or Megantereon magantereon) fit exactly into holes in the human skull shown. Large cats may have been useful in one respect. The kills of the cats may have been scavenged by the humans, since they had only simple chopping and scraping tools which may not have allowed them to bring down game of their own. 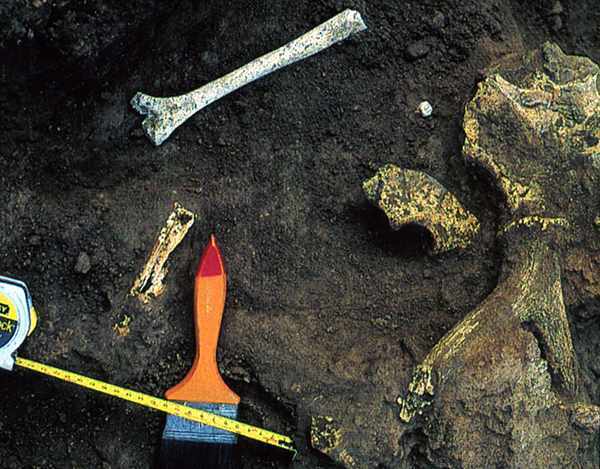 The bone is probably from a deer, and was found at the site not far from the stone implement shown beside it in this photo. 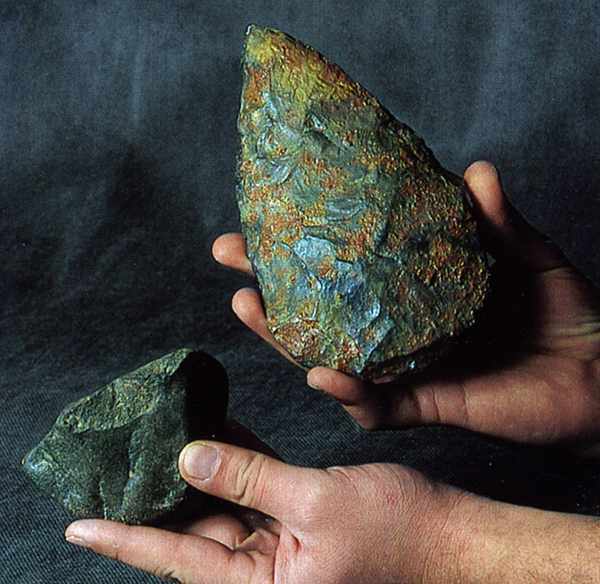 The stone tools found are simply worked cobbles from the rivers below the plateau. 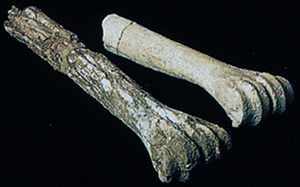 The tool on the left is from Dmanisi and may be compared with the much more sophisticated tool made by Homo erectus on the right. This leg from the giant ostrich Struthio dmanisensis demonstrates that emigration from Africa was not confined to hominins. Ostriches are adaptable and opportunistic. The wolf skull shown here had its antecedents in Eurasia. Wolves met the African species at this point, and presumably adapted to hunting the smaller members of the emigrés. 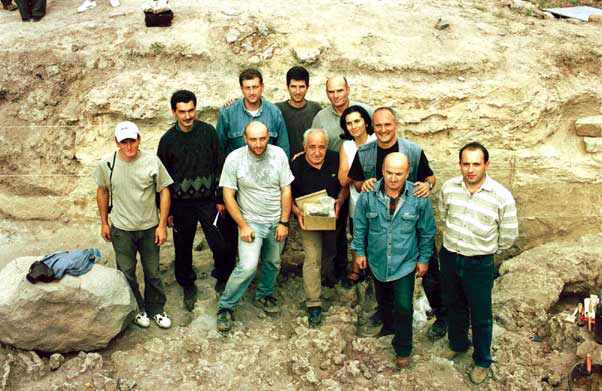 The team was led by Georgian researcher David Lordkipanidze, seen here at the centre in the blue vest. There was even a short necked giraffe (Paleotragus sp.) in the area around two million years ago. These are its foot bones.